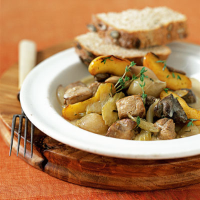 This rich, fruity casserole will warm you up on chilly autumn evenings. Serve with bread or creamy mashed potatoes for a hearty midweek meal. Preheat the oven to 180°C, gas mark 4. In an ovenproof casserole dish, melt a knob of the butter and fry the celery for 1-2 minutes until starting to soften. Using a slotted spoon, transfer the celery to a plate. Add the shallots to the pan and cook for 1-2 minutes until starting to brown. Remove and add to the celery. Add more butter to the hot pan and fry half the game for about 2 minutes until lightly browned. Repeat with the remaining game. Return the celery, shallots and game to the pan and stir to combine. Add the cider and allow to bubble for 1 minute. Add 2 of the thyme sprigs and season to taste. Put the lid on the casserole dish and cook in the oven for 40 minutes or until the game is tender. Heat a frying pan, add the remaining butter and fry the apple for 2-3 minutes until it starts to caramelise and turn golden brown. Remove from the pan and keep warm on a plate covered with foil. Stir the crème fraîche into the casserole and serve immediately, scattered with the apple and remaining thyme leaves. Serve with chunks of seeded wholemeal bread or mashed potato. To remove the shallot skins, bring a large pan of water to the boil and add the shallots. Cook for 2 minutes then drain and, when cool enough to handle, slip off the skins. The game can be substituted for 3 x 160g packs of pheasant breasts, each sliced into 4 (reduce cooking time to 30 minutes in the oven).